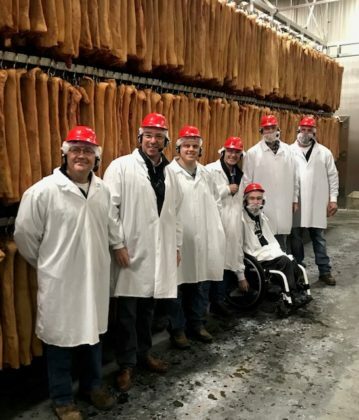 On November 29, 2018, a group of contract growers with Christensen Farms & Feedlots, Inc. (CF) went down to Triumph Foods and Daily’s Premium Meats in St. Joseph, MO, to tour the facilities with CF CEO, Glenn Stolt and VP of Live Operations, Jeff Rusch. The growers toured both facilities, where they were able to see the processing of pigs and meat products, as well as the highly advanced technology and mechanics at those locations. The growers, Thomas Ganske, Cody Runksmeier, Travis Schultz, Greg Schiefelbein and Ryan Schiefelbein, won this exciting trip last summer by attending the annual Producer Expo appreciation event. This event gives CF the opportunity to appreciate and recognize its contract partners who are committed to and take pride in being an industry leader in responsibly producing high quality pork for the noble purpose of providing food to a growing world through the role they play within our organization. Christensen Farms is one of the largest, family-owned pork producers in the United States, marketing approximately 3 million hogs per year. Headquartered in Sleepy Eye, Minnesota, the company operates throughout the Midwest with facilities in Minnesota, Iowa, Nebraska, Illinois and South Dakota. Christensen Farms owns four feed mills, manages 145,000 sows on 44 farms, and oversees more than 350 nurseries and grow finish sites. The company employs nearly 1,000 people and maintains 1,500 contract partnerships. The company is vertically integrated with a strong presence across the pork value chain – from farm to fork. Christensen Farms is the largest shareholder of Triumph Foods LLC, a producer-owned primary pork processing plant in St. Joseph, Missouri. In turn, Triumph Foods members own 50 percent of Daily’s Premium Meats, a specialty pork processor of bacon and other premium pork products. Triumph Foods also holds a 50 percent partnership in Seaboard Triumph Foods, LLC of Sioux City, Iowa, a primary pork processing plant.